Add Light Anywhere - No Wires, No Pliers - Just Stick It Up! The 120-degree motion sensor turns on when you appear & off when you disappear, detecting motion from 25-ft. away. No wires, no pliers required. Just stick it up & the industrial adhesive sticks to just about every surface. It's hard to see when you're outside at night. But it's such a pain to install a light. Introducing the Atomic Beam™ SunBlast®, the solar-powered light that's super bright. Atomic Beam™ SunBlast® lets you add a light anywhere. READ FULL DESCRIPTION There's no wires and no pliers. Just stick it up and you're good to go. The industrial-strength adhesive mounts to just about anything instantly. Try it on stucco, wood, siding, and stone. The built-in solar panels charge the built-in Lithium-Ion battery quickly. That means you won't waste money on batteries or high electric bills. Atomic Beam™ SunBlast® has a 120-degree motion sensor turns on the light when you get near and automatically turns off when you disappear. The state-of-the-art sensor detects movement from up to 25-feet away. Atomic Beam™ SunBlast® makes a great security light, too! The secret is that Atomic Beam™ SunBlast® uses LED chips built into a panel to create a super-bright solar light. Its unique wide-angle design covers much more ground, covering the sides, as well as in front. 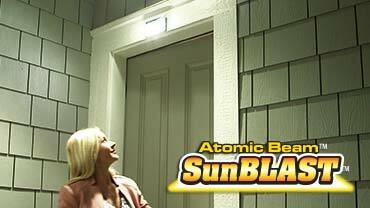 Atomic Beam™ SunBlast® is perfect for hanging over a dark doorway, a dark path, and on the garage. And two light settings give you control over how much light to display. Thanks to its heavy-duty construction, Atomic Beam™ SunBlast® is weatherproof in the rain and snow, so it shines bright all year round. The super-bright LED flat panels can last a lifetime without burning out! Light up the night with Atomic Beam™ SunBlast®. Get your Atomic Beam™ SunBlast® for only $19.99 plus $7.99 shipping and handling. But wait - double your offer and receive a SECOND Atomic Beam™ SunBlast® plus LED flashlight. Just pay a separate fee of $19.99. Hurry - this is a limited time offer, so order now! **Due to the lithium ion battery, this item cannot be shipped to a P.O. Box. SunBlast®'s Quick-Charging, Built-In Lithium-Ion Battery Is Solar-Powered! OFFER: Get Atomic Beam SunBlast for only $19.99 plus $7.99 shipping and handling. Double your offer to receive a SECOND Atomic Beam SunBlast and LED flashlight for a separate fee of $19.99. This limited-time offer isn't available in stores. UPGRADE to the DELUXE Atomic Beam SunBlast. The brighter light shines a greater distance, keeping you safer. GUARANTEE: Your satisfaction is 100% guaranteed. if you are dissatisfied with your Atomic Beam SunBlast for any reason, simply return the product within 30 days for an easy refund of your purchase price, excluding shipping and handling. See our return policy for more information.